How do you make Barbecue Pork Ribs that will melt in your mouth? It's easy, use your Instant Pot and follow these quick and easy guidelines. 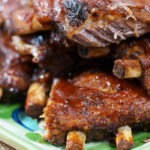 Tasty, tangy tender ribs that are moist and delicious are now possible in minutes instead of hours! Fall-off-the-bone, tender ribs finished on the grill. These ribs are lick your fingers, grab a roll of paper towels deliciousness! 1 cup apple juice or cranberry peach juice I've used both, use your favorite! 1 1/2 cups barbecue sauce use your favorite! Season both sides of the meat with a flavorful dry rub. Flip the ribs over and season both sides rubbing the dry rub into the meat. Roll up the slab of ribs - jellyroll fashion. Wrap well in plastic and refrigerate for at least 30 minutes - longer is better you can even do it overnight. Add one cup of juice to the bottom of the Instant Pot. Place the rolled up ribs on the into the IP and top it with a half cup of your favorite BBQ Sauce. Secure the lid of the Instant Pot, close the valve and set in on manual for 25 minutes. When the timer goes off quick release the ribs. Preheat the broiler or grill. Remove the ribs from the Instant Pot. Slather them with your favorite barbecue sauce and place them on a hot grill. BBQ for five minutes on each side or until the sauce is seared and delicious! Before starting, place parchment paper or plastic wrap under the slab of ribs this will make clean up a breeze! Taking the time to remove the silver skin will make the ribs much more tender. Be patient and remove as much as possible. Not only will it make it more tender, but the rub and sauce will be able to penetrate the meat, making it more flavorful.